VESA has revealed the eDP 1.4a standard and the new iteration supports VESA Display Stream Compression, enables new segmented panel display architecture and increases panel resolution support to up to 8K (along with some brand new features). 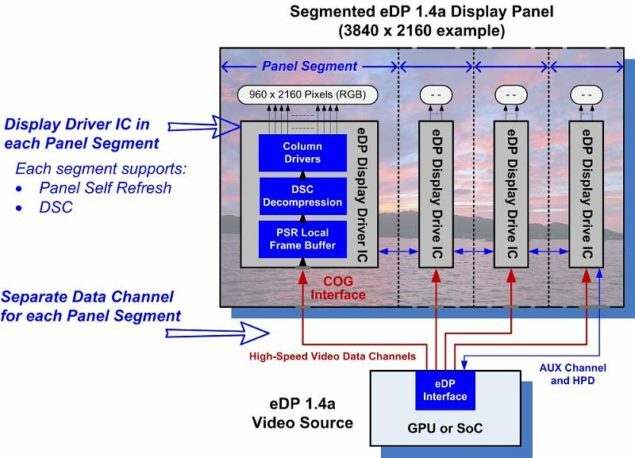 eDP is currently being utilized in both Nvidia GSync Mobility and AMD FreeSync so this new iteration is of interest to both camps. You can find the full press release published by VESA over at their homepage. Interestingly the AUX Channel and HPD seem to be favoring a same line return and a serial approach with panel division. This leads me to the next feature, something pretty important for future adaptive sync technologies: The inclusion of the partial update capability for Panel Self Refresh (PSR) that was introduced in eDP 1.4. Partial update enables the system video processor, or GPU, to update only the portion of the display that has changed since the video frame update, further saving system power. All in all, the mobility display technology niche is shaping up very nicely and we already know that Nvidia Mobility will be coming in a few months. To my knowledge AMD Freesync has yet to be commercial in the mobility side of things but I am sure these two techs will follow each other to the scene soon enough. While these two will be based on an older variant of eDP, eDP 1.4a is slated to enter mainstream markets by 2016, so its a full year away at least.